Samsung has recently released the Galaxy S9 but the tech giants, as well as Samsung fans, are desperately waiting to see what Galaxy Note 9 will offer and when it will be launched. However, latest reports claim that the company has just officially confirmed the Galaxy Note 9 for the first time and it may launch in August. Samsung was, obviously, not intentionally broadcasted this news. In fact, it went about as far away from snooping eyes as possible. But the Dutch technology site GalaxyClub has found Samsung filing the first official Galaxy Note 9 trademark in Columbia. 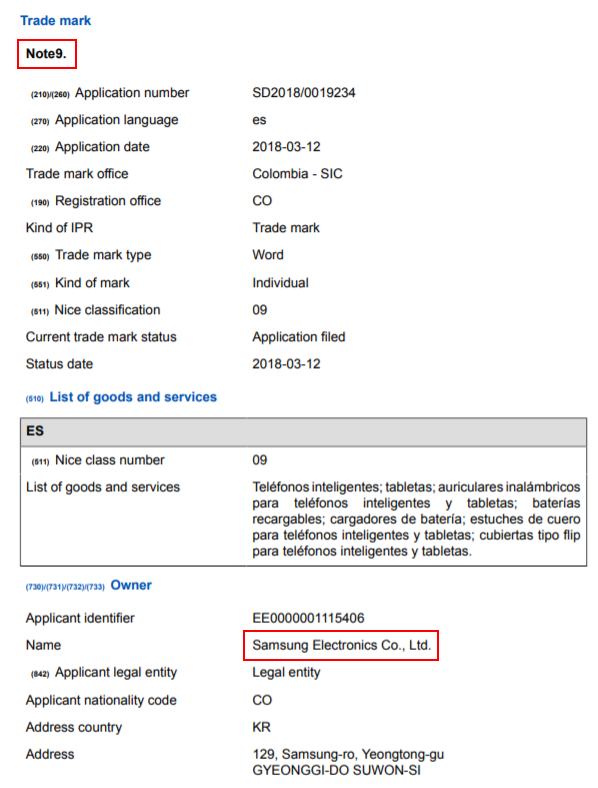 The spotted trademark listing doesn’t reveal much more than the application date, which is March 12th and that too comes from Samsung, which is already verified by its official South Korean HQ address. Going by the rumors surrounding Galaxy Note 9, a report by Forbes predict that the upcoming Galaxy Note 8 successor is set to be one of the most exciting and potentially radical smartphones released this year. However, the one major thing that will get an update in the Samsung Galaxy Note 9 is its design. Samsung is said to make the Galaxy Note 9 the first mass-market device with a fingerprint sensor integrated into its display. The South-Korean tech giant has previously rumored to do this with both the Galaxy Note 8 and Galaxy S9 but reportedly ran out of time. Moreover, the Galaxy Note lineup is set to boost the Samsung’s camera standards from the impressive snappers on the already launched Galaxy S9 and Galaxy S9 Plus. The major upgrade that we can see in the upcoming Galaxy Note 9 is S9 and S9 Plus’ weak spot, which is their woeful selfie cam. The dual front-facing cameras are the trendy as well as hot technology among Samsung’s biggest Asian rivals. Considering the fact, Forbes expects that this technology we can see in the upcoming Note 9. The report also notes that we might see some tweaks to the Galaxy S9’s clever dual aperture rear camera. Samsung Galaxy Note 9 is expected to come rocking a $900 price tag. The company could once again try to launch the smartphone before Apple will announce three new iPhones, including iPhone X Plus and iPhone SE 2, during the month of September. Considering this theory, Samsung Galaxy Note 9 might get unveiled in August, with the pre-orders starting the very next week. However, the shipments of the upcoming device could take place as early as the month of September, which will take away a noticeable percentage of the market share from the Cupertino based tech giant.